Enkerende Tented Camp is an intimate and exclusive camp, located on Ol Choro Oirowua, one of the most privileged areas in the Masai Mara ecosystem along the Mara river where one can observe the game life in the greatest Parks and Reserves of our planet. 1 Double suite Mara riverside especially suited for honeymooners, families, friends or those who enjoy big space, where you feel the genuine African queen, or king . It includes 2 spacious bedrooms with 1 spacious bathroom, 2 large private porches along the river and TV (DSTV). 3 Spacious river tents with spectacular views of the Mara river where you will not lose detail of the activity of many animals. 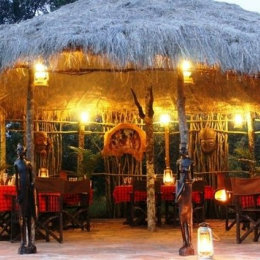 3 Mogambo tents, undoubtedly the most authentic, situated in the bushes as did the early explorers of Africa but with greater comfort and overlooking the African savannah. Enkerende Tented Camp prepares an elaborate international cuisine, where it fuses the best dishes of Spanish cuisine, continental and African by the best chefs in Masai Mara, paired with a wide selection of wines, champagne, liquors and spirits.